あごひげ 《★【類語】 「口ひげ」は mustache，「ほおひげ」は whiskers であるが，単に「ひげ」という場合には beard》. grow [wear] a beard あごひげを生やす[たくわえている]. He wears a long beard. 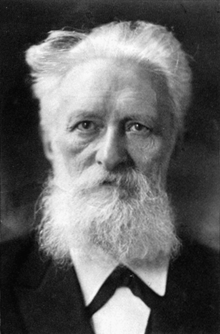 A man with a prominent beard. From Middle English berd, bard, bærd, from 古期英語 beard, from Proto-Germanic *bardaz (compare West Frisian burd, Dutch baard, German Bart), from Proto-Indo-European *bʰardʰeh₂, *bʰh₂erdʰeh₂ (compare Latin barba, Lithuanian barzda, Russian борода́ (borodá)). (botany) Long or stiff hairs on a plant; the awn. (printing, dated) That part of a type which is between the shoulder of the shank and the face. (LGBT, slang) A fake customer or companion, especially a woman who accompanies a gay man in order to give the impression that he is heterosexual. (obsolete) To grow hair on the chin and jaw. Robin Hood is always shown as bearding the Sheriff of Nottingham. No admiral, bearded by three corrupt and dissolute minions of the palace, dared to do more than mutter something about a court martial.
. . . I bearded the judge in his chambers and told him that it shouldn't be allowed. (transitive) To deprive (an oyster または similar shellfish) of the gills. From Proto-Germanic *bardaz (compare West Frisian burd, Dutch baard, German Bart), from Proto-Indo-European *bʰardʰeh₂ (compare Latin barba, Lithuanian barzda, Russian борода́ (borodá)).